Airplane washing - Tom Miller did much of this himself, asking for help only when an airplane needed to be put into position for washing. He did have a little bit of help from Ian Whitaker later in the morning. Tom managed to wash the Fokker D.VII, Meyers OTW, Great Lakes, Rearwin Sportster, Dormoy Bathtub and Bleriot XI. The airplanes all looked much, much better when he was through!! We needed to fly and refuel the airplanes we intend to fly at the Fly-In. The biggest question was around the Canuck. Last workday it was fitted with a prop labeled for a Curtiss OXX-6, a 100-hp engine and there are concerns whether the 90-hp OX-5 will pull that prop. So that airplane was hauled out and started first. It quickly became apparent that the carbs had a problem, as one bank of cylinders would run only when the choke was held out - which then caused the other bank of cylinders to run very rich! The Canuck was hauled up onto the shop patio and engine panels were removed to access the carbs. Dave Edgerly tackled removing and cleaning the spark plugs, while Dave Orloff and Ron Marcotte and others went after the carb jets. Very good progress was made on the fix. FHC has decided to go back to aviation gas for the flying aircraft as that fuel does not degrade into varnish like the auto fuel we've been using. I wasn't around at the end of the day, but the carbs were likely back together by the end of the day. More damage to the Triplane has been found... the fuel tank has been leaking, so I spent part of my day draining the castor oil out of the tank. Still need to drain fuel out and remove the tank for repairs. Ultimately the Meyers, Great Lakes, and Luscombe were all started and flown to a nearby airfield to be filled with aviation gas. David Whitaker went back to work on the Indian's clutch, but I don't think he was able to completely fix the clutch foot pedal's issues - so using the hand clutch will still be necessary. Still, the bike is running pretty well! Cameron Whitaker seemed to spend much of his day tinkering with the Model Ts - I believe he got 3 of them running and exercised. Plus some puttering around on the Maytag! 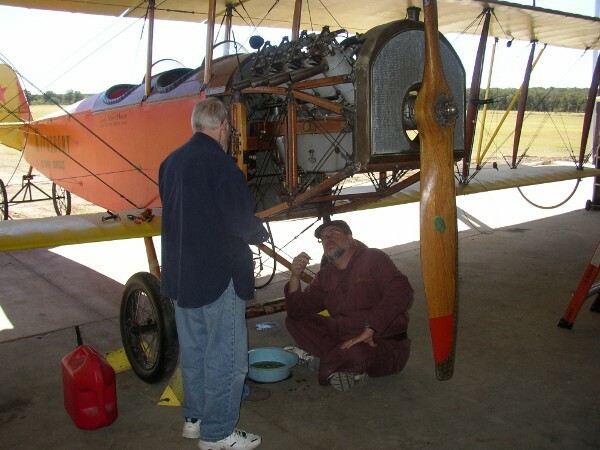 Doug Hortvet spent some time working on the Canuck engine, but then he and Dave Edgerly went to work on the Triplane engine swap. The rest of the accessories and engine mount were removed from the triplane's engine and swapped onto T-1's crankcase. So that engine is going back together for the triplane thanks to Dave and Doug's efforts.